Microsoft yesterday opened up the source code for its legal practice management software Matter Center for Office 365. It posted the code to the developer site GitHub, where it hopes that outside developers and partners will participate in further developing the software’s capabilities. I wrote here last August about Microsoft’s launch of Matter Center, its long-rumored practice management platform built to work with Office 365. It was originally designed by Microsoft developers for use by Microsoft’s internal Corporate, External, & Legal Affairs department. Microsoft’s Corporate, External, and Legal Affairs (CELA) group, in partnership with the Office extensibility team, developed Matter Center for Office 365 — a document management and collaboration solution built using the Office app development model, Azure and Sharepoint. It takes advantage of the enterprise content management capabilities of the SharePoint platform, and offers many additional benefits through Add-ins in Outlook and Office (e.g., Word, PowerPoint). This allows the solution to quickly create, find, and store documents on predefined projects or matter sites. Matter Center takes advantage of the enterprise-grade cloud platform of Office 365 and Azure, so these productivity gains are realized while also reducing risk and cost. This project was originated by the Microsoft Matter Center Engineering team. We wanted to build a solution to help our own legal professionals improve their productivity. Based on our conversations with many people in the industry, we decided to open source the project so others can use and enhance this solution. The page includes a list of architectural priorities that Microsoft is hoping outside developers will help with. 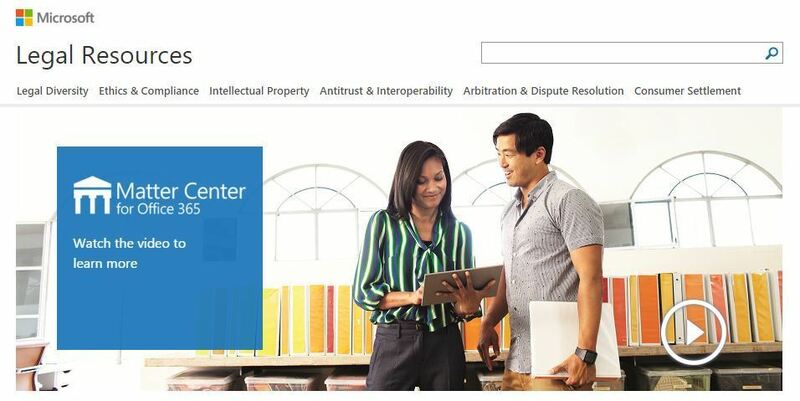 In a Microsoft Office blog post, Microsoft says that Matter Center has already proven its usefulness and will allow developers to rapidly deliver great solutions for users in the legal space. We are confident that Matter Center will be immediately useful for legal professionals. These professionals at Microsoft have the same set of business productivity demands as their peers at other companies, firms and industries. It is critical to be able to organize and quickly find project content, emails, attachments and collaborate with team members of the organization—both internally and externally. And because Matter Center was designed with the needs of legal users first and foremost and then actually deployed and proven within CELA, we know that it will be broadly useful for other legal customers. The terminology in Matter Center may be legal specific, but the scenarios enabled in it have applicability in a broad range of professions. We followed a few simple principles while developing the solution, which included keeping the user experience centered within the Office tools where our attorneys spend their time, providing access without installing additional software on the desktop and ensuring all content is available and accessible anywhere, on any device and at any time through Office 365. The solution has been was such a hit internally that we decided to extend it beyond our four walls. We’ve since worked with IT solution providers and software vendors who service the legal industry to use Matter Center as a model for how solutions can be built with Office 365. Our partners were empowered to deploy the solution to their customers and build on top of our technology and extend Matter Center in a customized way that addresses the entire matter document management lifecycle—including bulk email management and ethical wall integration scenarios. This is certainly an interesting development. It also comports with something I reported here almost a year ago — which is that Microsoft will not be offering this as an off-the-shelf product. If you want Matter Center in your firm, you will have to work with one of Microsoft’s partners in the legal vertical or an independent developer.